Please join us for hors d’oeuvres, wine, and beer in support of the Educational Alliance Preschool at Manny Cantor Center. 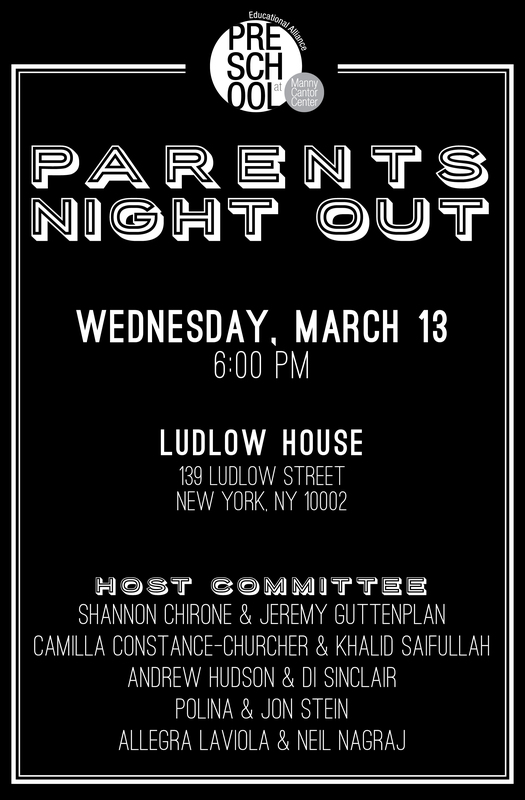 This event helps raise much needed funds that allow our school to remain welcoming and accessible to children and families on the lower east side by creating a financial aid fund. The value of your ticket, less $25, is tax-deductible to the full extent of the law (E.G. $40 of a $65 ticket). * While any amount is appreciated, if each family donates at the Benefactor level we will be able to meet this year’s fundraising goal! If you cannot attend Parents Night Out, but would like to make a donation, please click here.